Let the spring produce shine! 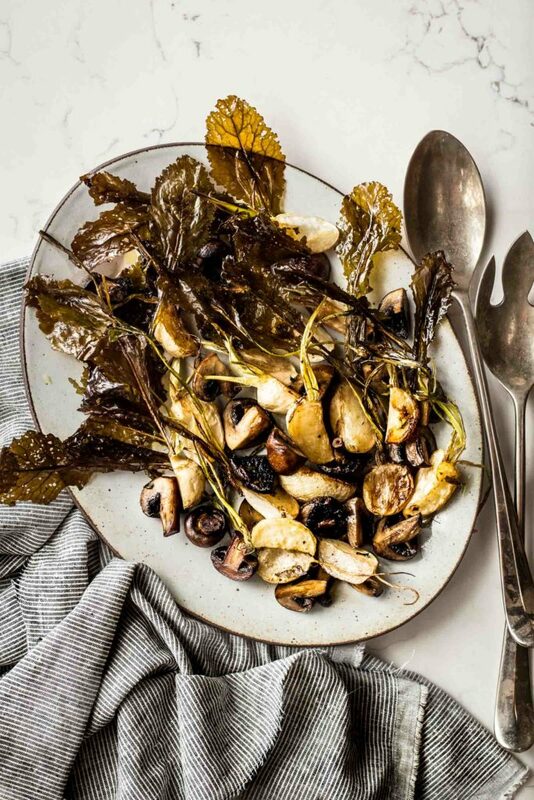 This side dish of roasted turnips and mushrooms is a true celebration of the season’s bounty. I chose to make this recipe because our CSA members and farmers market customers are seeing a lot of spring turnips from us these days and I want to highlight them in more recipes. When you’re shopping for turnips for this recipe look for the Japanese variety known as Hakurei (or salad turnips). They’re smaller than traditional storage turnips and have a lovely sweet bite. This method of cooking them with “meaty” mushrooms and simple seasonings makes for a simple, yet elegant side dish. I roasted the turnips with their greens still intact which was awesome because they became really crispy (almost like a kale chip). However, if your turnip greens aren’t in good shape no need to roast the turnips with the greens. That step is optional. This dish tastes great alongside grilled chicken or steak for a lovely springtime meal. I hope you all enjoy this dish as much as we do. Preheat the oven to 425F. Toss the turnips, mushrooms, garlic and thyme with the olive oil. Season to taste with plenty of salt and pepper. Place on a rimmed baking sheet and roast in the oven until the turnips are tender and golden brown, about 25-30 minutes. Toss the veggies halfway through cooking. I like turnips very much, although I am not pretty sure is the turnip here in Poland same with your. Recently I bought white turnips and I ate it as a sandwich top. I think I should also roast it, it could be great!